In the past, depth psychology has largely confined its reflections upon animals to human dreams and encounters. 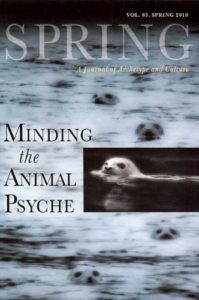 In Minding the Animal Psyche, Spring: A Journal of Archetype and Culture, seeks to greatly broaden this inquiry, turning the psychological eye from its inward gaze to honor and explore the psyches of our animal kin and the mutual interrelationships that exist among species. As our global society moves from anthropocentrism to ecocentricism, individuation of the ecopsyche mandates that we reflect on what animals bring into our lives and what we bring to the psyches of the animals with which we live. Psychology’s acknowledgement of the animal psyche—in the same way that we do with the human psyche—represents a dramatic, expansive shift and an exciting opportunity to bring insights from animal-oriented disciplines to depth psychology.